The sport climbing crag of Mouzaki was our first stop after the scary multi pitch climbing in Meterora. 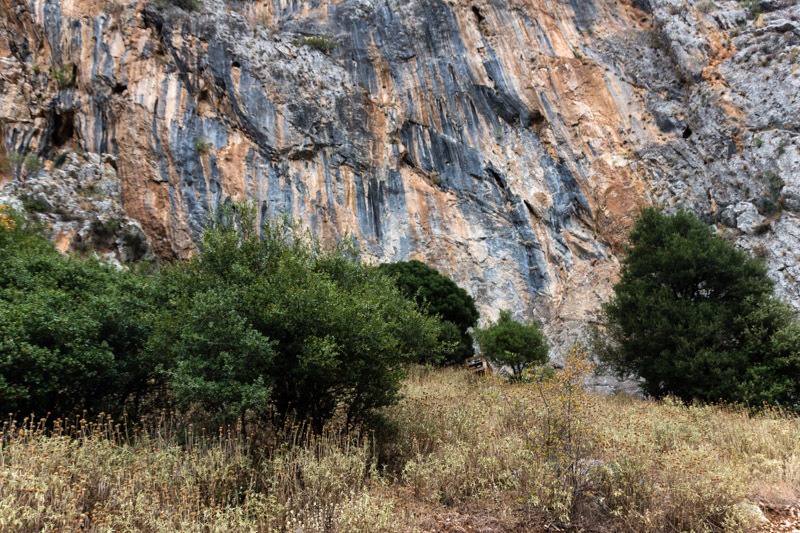 Even though this area might not be the largest climbing area in Greece, it offers some very nice sport routes. The absolute plus point of this area is a large wooden platform next to the wall, plus a small hut, where you can spent the night for free. This was build by the local climbing community and makes this place a small hidden gem. As there is no water access or easy access to food, it is not ideal for a cycling trip, but still doable. More about our climbing adventure in northern Greece can be found here. An amazing wooded platform serves in Mouzaki as a perfect resting place. Rock and routes: The climbing crag in Mouzaki is divided in two areas, the right and left side. On the right side are rather easier an vertical routes, but some of them are rather dirty and contain lots of vegetation. The left side is more overhanging and offers hard routes on tufas. Climbing area and environment: The view from the climbing crag and the wooden platform is beautiful. 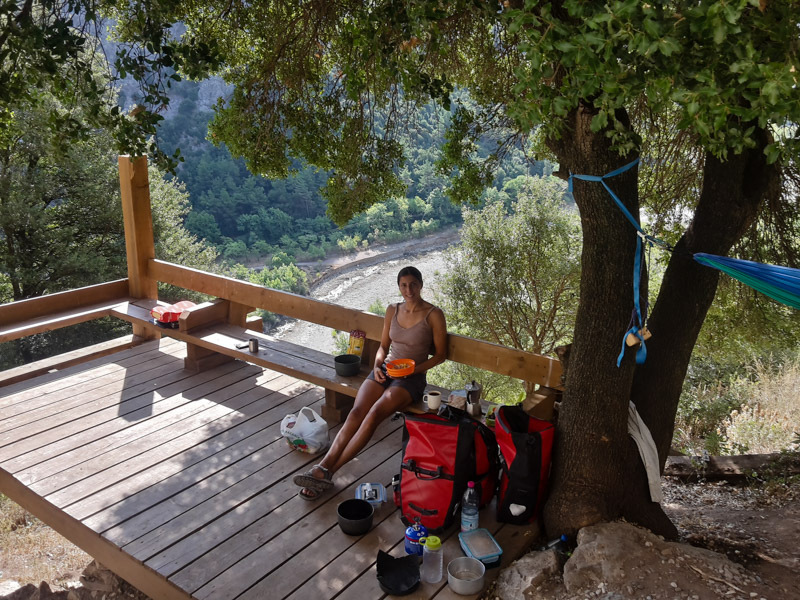 The valley is very quiet and it is perfect to relax after some hard routes. The nature here is beautiful and we had several tortoise visiting us during the day. Guide book and information: We used the 2nd edition of the guidebook ‘Greece Sport Climbing Guidebook’ by Aris Theodoropoulos. It provides clear photo topos of all routes, plus any necessary information about access or climbing seasons. The right side of the wall offers lower grade in the 6th French grade. Going further left the wall gets steeper and the grades get harder up to the 8th French grade. Most of the wall is south-east facing and therefore in the sun most of the day. This makes the wall too hot to climb during summer. Winter can be rather cold, but could be possible to climb on sunny days. Spring and autumn are the perfect season for Mouzaki. The upper part of the climbing wall in Mouzaki, the left part includes lots of hard routes. 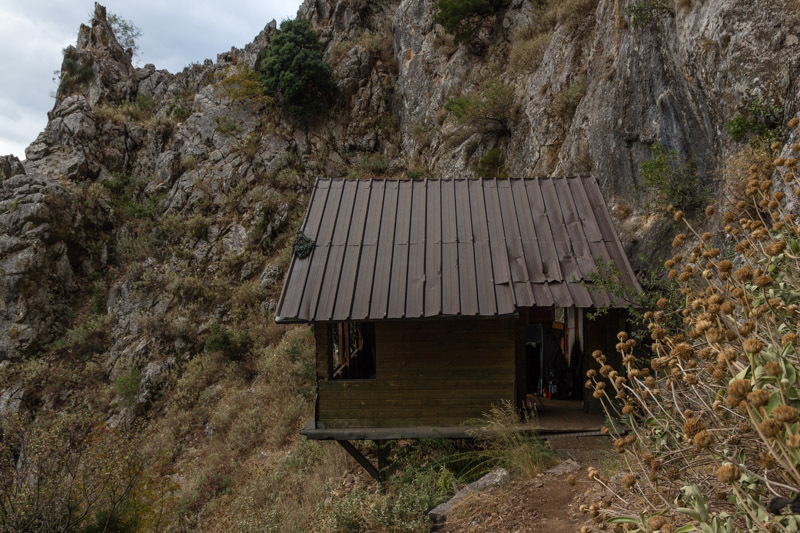 Accommodation: The small hut next to the climbing wall is an excellent accommodation. It feels so nice to sleep directly next to the wall and it is very quiet during the night. Access to food: The next supermarket is in the village of Mouzaki, which is about 3 km away. Unfortunately, you also have to climb about 120 m to come back to the climbing crag, which can be exhausting with a fully loaded bicycle. Access to water: There is no water at the climbing wall, so you also have to bring that. We found a public water tap next to a small chapel about 1 km further uphill following the street. This way we could at cycle up with an empty bicycle and roll down with all the water on our racks. Access by bike: The road from Mouzaki to the climbing crag is rather steep and it goes up for about 120m. This is still doable, but you also have to carry up all your stuff to the hut, as you cannot access the hut by bike. So it is doable, but not the easiest way. Perfect holiday house up at the climbing crag of Mouzaki. Build by the local climbers and it can be used for free.